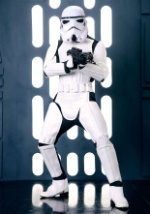 You will feel like you stepped right out of the Star Wars universe with this authentic Stormtrooper costume. The extremely detailed uniform pieces are all made of high quality molded plastic, which together form the perfect Stormtrooper costume. The chest and codpiece are attached to one another with two elastic straps, and the pieces connect to the back and bottom pieces with Velcro. The chest and codpiece, as well as the back and bottom pieces have molded details, including an attached, injection molded belt. The shin and thigh guards have a Velcro closure running down the back seam, and the thigh guards have foam padding for a comfortable fit. The arm guards and gauntlets connect with Velcro, and a hand cover piece attaches to the gauntlets. The shoulder guards connect to the arm guards with Velcro as well. This amazing costume also includes a black polyester jumpsuit and black costume gloves. The collector's edition helmet has full color details and see-through lenses. The interior measures 26" in circumference and has foam padding for comfort and great fit. A full-color guide to putting the costume on is also included. 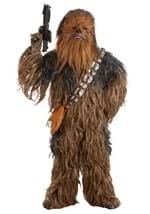 Have everyone talking at your next party with this officially licensed Star Wars costume. ATTENTION CUSTOMERS: This product cannot be shipped in its original box to Australia, Canada, Great Britain, Guadeloupe, Israel, Mexico, New Zealand, Russia, Singapore, Italy, Lithuania, Slovenia, South Africa, Taiwan, Thailand or Ukraine.